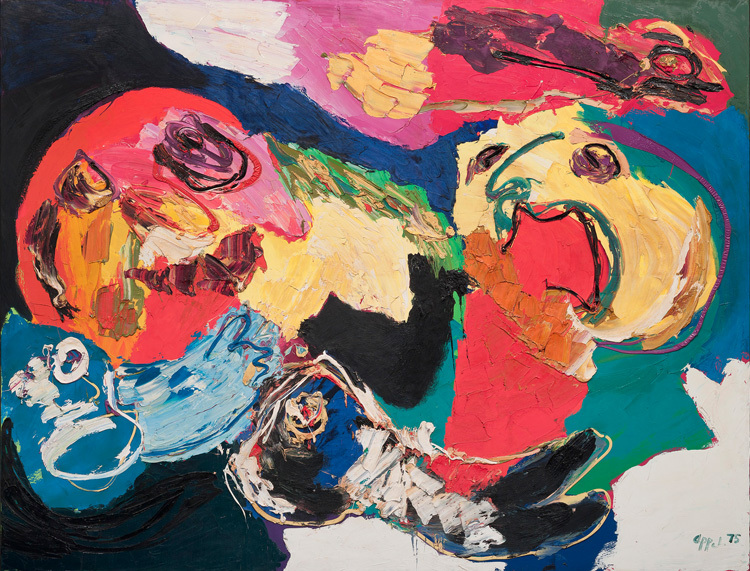 In conjunction with recently opened Karel Appel: A Gesture of Color, Marketing and Communications Intern Olivia Bensimon responds to one of the works of art featured in the exhibition. What struck me first when I saw this painting was how much it reminded me of two people bickering. The yellow Pac-Man-like shape on the right has its mouth open, as if it was yelling, whereas the red Pac-Man-like shape on the left seems scared or disgruntled. The surrounding shapes might be identified as legs and arms, but I see these “faces” as the focal point. Letting my mind wander, I begin to imagine a more full story for these two characters: the red shape has been taking a nap in some sort of suit, with a blue shirt, white pants, and black shoes. The yellow shape walks in to see the the other lounging around and begins to yell and shake its arms above its head. That’s when the red shape wakes up, confused and also very sleepy. The title of this painting, Floating like the Wind, could be interpreted in many different ways, but what comes to my mind is that the emotions articulated in the painting are floating like the wind—the dark blue representing sleepiness, the black and red pouring out of the yellow shape’s mouth representing anger and frustration.